I don’t think I know any immigrants personally. I know that I’m the descendant of immigrants; I seem to recall a story about my great-great-grandfather avoiding a war by stowing away on a barge headed to America. As San Diego native, too, I know that I went to school with the children of immigrants, Latino boys and girls who comprised 60% of the student populace in my hometown. The closest I’ve come to having a relationship with immigrants was in college, where I encountered international students from Indonesia, Vietnam and China pursuing their degree and living in America thanks to their student visa. Other than that, though, I only know what I hear and read and see, and maybe you’re that way, too. See, for many of us, immigrants and refugees can become little more than talking points. We hear the statistics: 43.3 million foreign-born people in the United States, and 11.1 million of them legally unauthorized to be here. We know the stances because we see people hash them out (often yelling their point) on news programs. We’ve seen the tweets, we listen to the talk radio and we’ve read the articles. We’ve probably got our own opinions on the matter. But how well do you and I actually know the immigrants these conversations are about? How often do we see immigrants not just as abstract concepts, but as human beings? Enter one of the most important novels you could be reading right now, “Behold the Dreamers” by Imbolo Mbue. 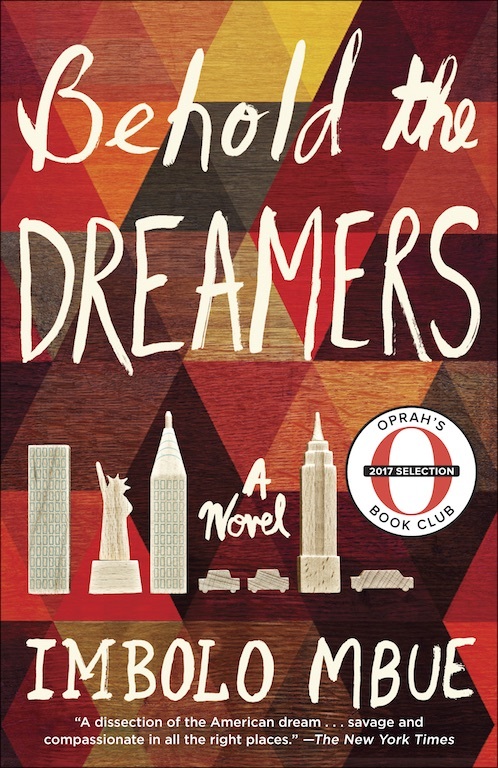 “Behold the Dreamers” was published in 2016, and received glowing reviews, winning Mbue the 2017 PEN/Faulkner Award and a spot in Oprah’s book club (which is a huge deal, believe it or not). There is so much worth loving about this book, from its meditations on class and race, and its examination of the 2008 financial crisis, to its characters, radiant dialogue and rich descriptions of New York City. But the main reason to read this book, I think, is because it puts you face-to-face with immigrants in America. We see America through the eyes of those who sacrificed so much to be here. Meet Jende Jonga, a livery cab driver, and his wife Neni, a part-time medical school student and full-time mother, both of them Cameroonian immigrants, both living in a one-bedroom apartment in Harlem and raising their six-year-old son Liomi. You’ll empathize with them immediately, trust me. “Behold the Dreamers” does what statistics cannot: it narratives the immigrant experience by inviting you along for the ride. We join Jende in the most important job interview of his life, as he meets with Clark Edwards, an executive at Lehman Brothers, to discuss the possibility of becoming the Edwards family chauffeur. We feel the nerve-wracking tension when Clark asks about Jende’s “papers,” and then immense relief when Clark offers Jende the position. Later, we sit with Neni from midnight to three, after she has ironed clothes and cooked dinner, after Jende and Liomi have gone to bed, as she finally finds the time to study for her calculus exam. We see her determination, her exhaustion, her love for her family and her belief in what America has to offer. Throughout “Behold the Dreamers,” we get a glimpse of what life is like for millions of people in America. We dream and hope with Jende and Neni as they cast visions of their future: moving to a two-bedroom apartment in Mount Vernon or Yonkers, Neni becoming a pharmacist, Liomi becoming a doctor or lawyer. We grieve with them as the housing market plummets in 2008 and their plans and aspirations come tumbling down. We see America through the eyes of those who sacrificed so much to be here; Jende is convinced that “anything is possible for anyone who is American.” We gain a better grasp of just how frustrating our current immigration system can be, and we begin to understand why some families would do anything just to remain here. By reading this novel, we as readers can experience the life of the twenty-first century immigrant to America, the joys and dreams as well as the struggles and setbacks. “Behold the Dreamers” is a beautiful novel, but more than that, it is a profoundly necessary novel, because, let’s face it—the immigration debate isn’t going away. For one thing, it remains a central focus of the current administration. But also (unless something drastic changes), our country has always drawn immigrants from every corner of the globe. So, the conversation regarding immigrants and refugees will certainly persist, but it’s extremely important, I think, to know who exactly we’re talking about. They’re people, after all. They have names like Jende and Neni. If we’re ever going to discuss immigration in a humane and decent manner, then we need to first recognize immigrants as human beings, with dreams and foibles of their own. “Behold the Dreamers” can help us begin to do that. If we’re ever going to discuss immigration in a humane and decent manner, then we need to first recognize immigrants as human beings, with dreams and foibles of their own. But then, of course, we need to move beyond the fictional and into the interpersonal. After all, you and I encounter flesh-and-blood immigrants every day. We live in the same apartment complexes, go to the same churches, stand in the same grocery store lines. Who are they? What are their stories? What are their hopes? Let’s find out. Let’s start with “Behold the Dreamers.” And then, let’s begin to know the dreamers in our midst. “Behold the Dreamers” is available for purchase here. To learn more, visit www.imbolombue.com/behold-the-dreamers/. George Saunders’ award-winning novel is tragic, hilarious, thought-provoking, gorgeous and exactly what we need to hear.